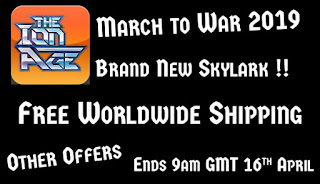 The Ion Age Blog: Free Worldwide Shipping Offer until 16th April plus get the new Skylark Patrol Flyer at 25% off! 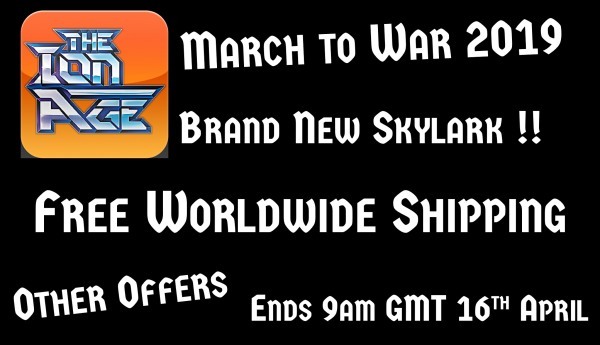 We are a wee part of Alternative Armies and as such are doing our bit in the mega March to War event which is now on! Until 16th April 2019 there is free worldwide shipping on all orders of 20GBP or more in the cart plus you get your Reward Points and you can use your Reward Points in these orders to save more. The standard shipping will automatically be free while the signed for shipping option remains at its normal cost. You need do nothing but add to cart. As well as this we have the brand new Skylark Patrol Flyer (replacing the MkI) which is now on the website at 25% off its regular price. There are no pictures or full details for the moment since we will do its full news later this month with fanfare! 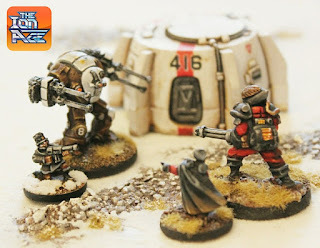 By IonFan request we have also got an event long discount of 25% off both variants of the popular Steornede Battlesuit. Twin cannons or twin missile pods. Excellent! 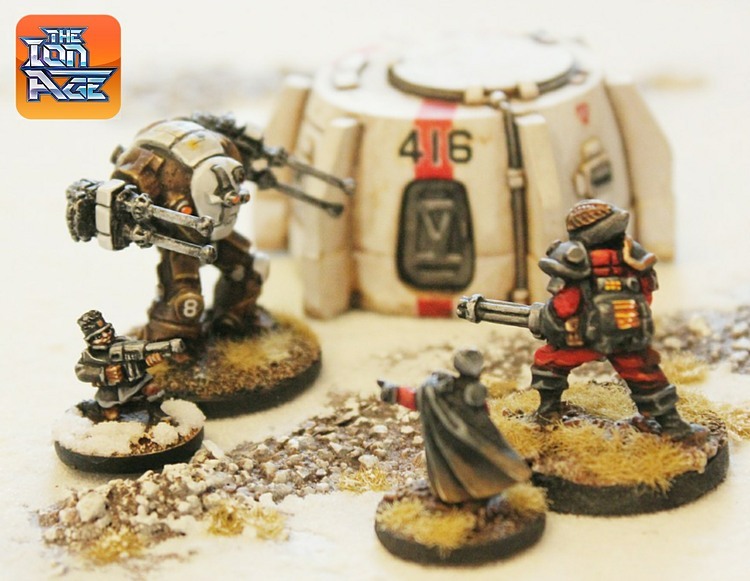 If you missed the massive release of the Magog War Mecha kits (80mm tall) in three variants then now is a good time to get yourself one or a bundle of them as they are all free shipping worldwide during this event. See them HERE. 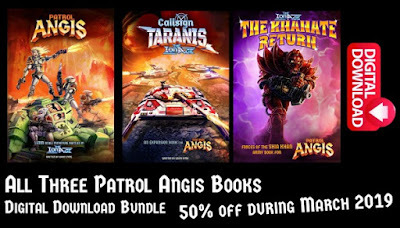 Also until the end of March we have 50% off the three book digital bundle for Patrol Angis meaning you can get Patrol Angis, Callsign Taranis and The Khanate Return (192 pages of space opera awesome) for just 18.00GBP with immediate virtual dispatch to your good self upon purchase. Go HERE. During this event we will have a new offer on 1st April 2019 so check out The Ion Age then too as we will still be within the event which ends on 16th April at 9am GMT. 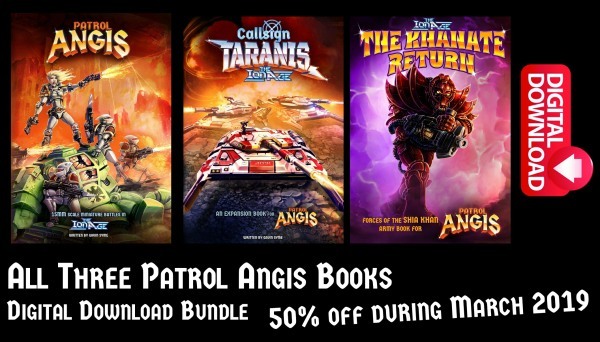 I want to thank you all for your support and if you wish to combine up any codes from The Ion Age with those from Alternative Armies then you can do so by emailing me on info@theionage.com giving your name, paypal email address and shipping address plus list of all wanted packs. I will reply with a total to pay and an invoice. You will get all the offers including 10% off on the Alternative Armies codes.